What makes a super hero? Think about it. Is it their powers? Their morals? What even makes a hero? What kind of history is a hero expected to have? They stand up for those who can’t stand up for themselves. They are courageous and fight for what they believe, even when everyone else cowers. They are the most powerful people around, yet they choose to serve the weak instead of demanding that the weak serve them. Super heroes don’t have it easy. Frequently they have their own pain, their own history, their own losses. But still they push. They sacrifice. And they refuse to become numb to the hurt that surrounds them, because, in receiving powers, they also received a great responsibility. A responsibility to see the hurting. And to help them. Wait….Am I describing super heroes or Christians? Well, both! When Jesus ascended, he passed a torch to his followers. Carrying that torch is our responsibility and, through the Holy Spirit, we have the power to do so. But what exactly is the torch Jesus passed? Jesus said, “…the Son of Man did not come to be served, but to serve and to give His life as a ransom for many,” (Matthew 20:28). The Lord of all creation came down to our level to give us exactly what we needed. He served us. He gave his life that we may live. And THIS is our example. THIS is the torch we now carry. A torch of love. A torch of service. A torch of Sacrifice. When asked about the greatest commandment, Jesus replied, “The most important one…is this: ‘Hear, O Israel: The Lord our God, the Lord is one. Love the Lord your God with all your heart, and with all your soul, and with all your mind, and with all your strength.’ The second is this: ‘Love your neighbor as yourself.’ There is no commandment greater than these,” (Mark 12:29-30). Jesus didn’t stop there! He demonstrated this love for us by washing the feet of his disciples, even the one he knew was preparing to betray him! This is not something you choose to do unless you are making a point! Unless you are declaring, “I love you! I will serve you anyway you need. I will wash the dirtiest part of you without batting an eye and I will suffer through torture if it means you might spend eternity with me.” How great a love! How great an act of service! After washing their feet, he said, “You call me ‘Teacher’ and ‘Lord’, and rightly so, for that is what I am. Now that I, your Lord and Teacher, have washed your feet, you also should wash one another’s feet. I have set you an example that you should do as I have done for you. Very truly I tell you, no servant is greater than his master, nor is a messenger greater than the one who sent him,” (John 13:13-16). Whoah… THIS is what carrying the torch is! Loving, even when you receive nothing in return. Serving, even when your enemy stands before you. Sacrificing, even when it’s your home, your family, and maybe even your life. And why? Because this is what our Lord and Teacher did. Why? Because this is what our Lord and Teacher tells us to do. Why? Because we are not greater than our Lord and Teacher. But… what does picking up the torch and running with it actually look like? Does it mean we all get super speed? We all teleport? We all become unbelievably awesome at playing the harp? What does it look like? It looks beautiful. 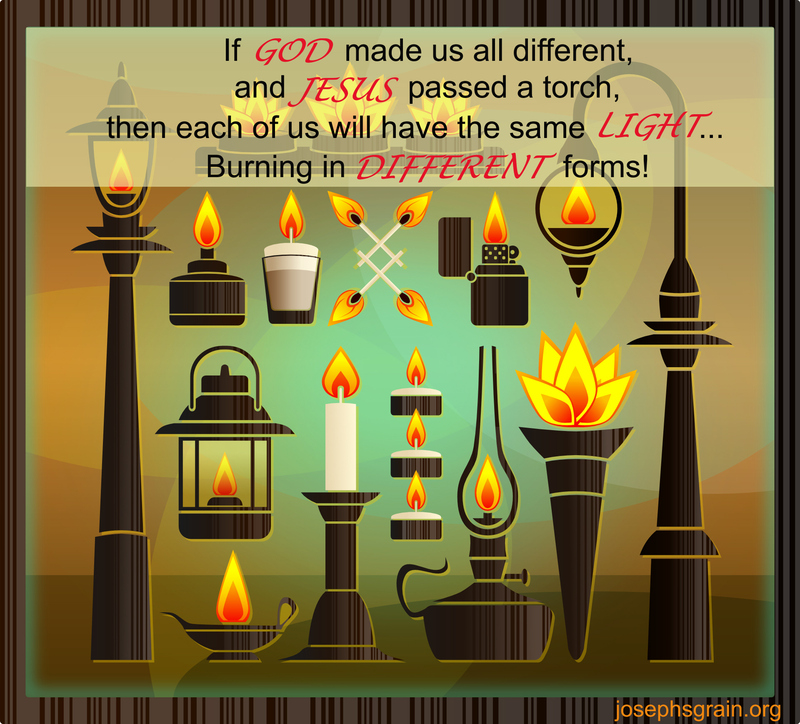 As tens, hundreds, thousands, millions, of people branch out under the power of God, taking light to even the darkest regions! As we all look at our own talents and ask God how to use them for his glory. As we begin living out the example Jesus gave us in slightly different ways – some of us caring for orphans, others extending an arm to the persecuted, others spending hours on our knees in prayer, and still more! Running the race. Carrying the torch Jesus passed. Who is your favorite super hero? Why? What are his/her powers? Weaknesses? What are some challenges they have faced? How has being a Christian changed your life? What are some challenges you have faced as a Christian? What are some responsibilities you have as a Christian? Read and discuss Matthew 20:26-28, John 13:13-16, and Mark 12:29-30. What stands out to you about these verses? Why? When Jesus ascended, he passed a torch to his followers. What is he asking us to do? Does he ask us to do anything he hasn’t already done? Start praying for God to show you how you can serve. What your powers are. Are you skilled with sewing or cooking? What gifts has God given you? How can you use your gifts to carry the torch and glorify God?